U.S. State Governors must decide how to comply with a provision of the Patient Protection and Affordable Care Act (PPACA). State Insurance Exchanges (HIX) are a component of building a foundation for PPACA, providing individuals and small businesses with a way to shop for and purchase health insurance. Every State is required to declare their intentions on how they will comply with the law. Initially, States had a deadline of Friday November 16th to declare their intentions. HHS extended the deadline for states to submit detail plans for a state-based insurance exchange for one month to accommodate many governors who waited until the election outcome to decide whether to move ahead. We’ll follow State and Private Exchanges, the health plans that participate, as well as the unique business models and consumer usability of Exchanges when they launch. Regardless of the outcome of the Presidential Election, some States had already made Insurance Exhcanges law, and therefore would have been proceeding whether the PPACA was repealed or not. 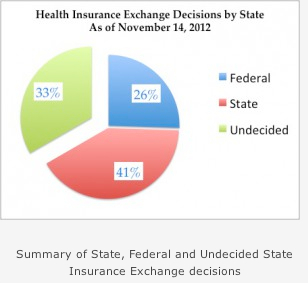 Other states waited until after the election and have until this Friday November 16, 2012 to declare their intentions about a State vs. Federal HIX. The Maryland Insurance Exchange, the California Insurance Exchange (known as Covered California), and the Oregon Insurance Exchange were legislated prior to the election. Utah was the first State in the U.S. to develop an Insurance Exchange well before the Patient Protection and Affordable Care Act went into effect. In Utah, there has been a strong heritage of cooperation and interoperability among the health care companies, and the State Legislature. UHIN, the Utah Health Information Network was the first to be certified by EHNAC to meet HIPAA privacy and security requirements. Texas and Arkansas have declined to develop State Exchanges and will therefore by fiat of the Federal law be accepting an exchange that is managed by the U.S. Government. Still other states such as Nebraska state that their questions to the Federal Government regarding Insurance Exchanges have not yet been answered, therefore they cannot decide by the deadline. Governors in states who said “no” to build a state run and state funded exchange don’t want to pay for it. There have been recent articles regarding state’s concern about their inability to fund the Exchanges, and to make them sustainable. 3. Allow the federal government to run a program for them. States that don’t act will default to the federal program. As of Wednesday November 14th, here is an update on which direction each state is headed. In most states, the Governor’s office has sent a notification to the U.S. Department of Health and Human Services upon deciding whether to develop a State Insurance Exchange or accept the Federal Health Insurance Exchange. Ironically, some States with Republican Governors who might be expected to want less Federal invovlement have opted not to invest in a State Insurance Exchange, stating that they will not opt for a local exchange. While both sides of the aisle have historically backed HIX as a way to increase efficiencies, Republicans have seen it as a way for States to have self-determination and therefore have backed a State HIX approach. Democrats have backed a national, Federal HIX approach. However, the PPACA passed along with HIX related regulations without Republican support, so, though it may seem counter-intuitive, some Republican Governors have be reluctant to back and endorse a State HIX. IRS tax consequences in terms of fines that can be levied on those who do not have insurance may also vary based on whether the Federal or State Insurance Exchange approach is taken. ICD-10, the International Classification of Diseases, version 10 which will be used to describe the health of the patient or “member” of the insurance plan, since it will provide more detailed diagnosis and procedure code information. HIPAA 5010 – an electronic standard mandated by the Centers for Medicare and Medicaid for the transmission of enrollment, eligibility, claims, claims status and electronic funds transfer information where HIPAA protected patient information (PHI or Personal Health Information) is involved. CORE Operating Rules, which specify real-time eligibility information at the point of care. Privacy and Security rules. The Office of Civil Rights (OCR) of the Centers for Medicare and Medicaid (CMS) is performing audits of HIPAA Covered Entities. Approximately 80% of the audited businesses are failing their audits. Insurance Exchanges must try to make the complex simple in two ways: 1) people must be able to shop for and purchase insurance, wile gaining a clear understanding of coverage and pricing, and 2) we believe that these Exchanges will function as portals for managed care companies to provide patient and member engagement information. Research proves that most healthcare issues can be mitigated if not avoided by changes in lifestyle and environment. As Exchanges provide more sophisticated capabilities they will serve as a conduit for this type of information. Patient engagement will therefore also be a component of Exchanges at some point in the future, as will tailoring content for mobile web surfers. Aon Hewitt announced an exchange with two self-insured employers (Sears with 90,000 employees and Daren restaurants (Olive Grove, Red Lobster) with 45,000 employees. United, Cigna, and Health Care Services Corp are participating in the exchange. ADP has also started work on a private HIX. mHealth and consumerism will also factor into the future of healthcare content in HIX. The intersection of increased mobile web surfing and content will be important, particularly for private exchanges. Consumers will shop using their web phone and expect content that is optimized for this experience. According to Mark Bertolini CEO of Aetna, at the end of 2010, 9 percent of mobile phone users had apps on their phones to track or manage their health. By 2015, experts predict 30 percent of smartphone users are likely to use wellness apps. Status of each State as of November 14, 2012. About the HEIT Index – the Health Exchange and Insurance Tracking Index follows State level initiatives on providing Insurance coverage, the methods for shopping for and purchasing the coverage and other services such as patient engagement that are expected to be facilitated by the Exchanges. The HEIT Index is a trademark of No World Borders, Inc.